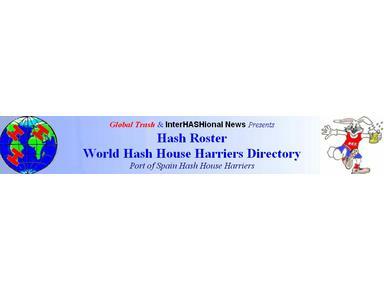 Welcome to the home page for the world's most eccentric running club, the Hash House Harriers. Now with 1956 hash groups registered in the world directory, located in 1274 cities in 185 countries, it is easier than ever for you to find fun, trail, and friendship where you live. The Hash House Harriers is a more social version of Hare and Hounds, where you join the pack of hounds (runners) to chase down the trail set by the hare or hares (other runners), then gather together for a bit of social activity known as the On In or Down Down with refreshment, humor, song and the occasional feast. In most groups, all are welcome, young and old, fast or slow, so don't wait to get in shape, just come on out and join us. The only prerequisite to hashing is a sense of humor. It's that simple.